Swan Creek Pottery & Cast Iron Refill Kits include everything you need to refill any of their pottery or cast iron containers. Kit includes wicks, glue tabs, instruction sheet, and 24 oz. 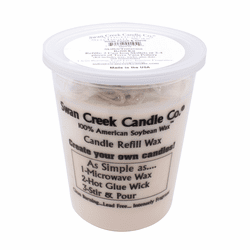 of microwaveable Swan Creek American soybean wax. Crisp Cotton � Fresh air blended with clean linen; a year round customer favorite!